SUBJECT: He has "known My Name"
God desires that we know His Name. 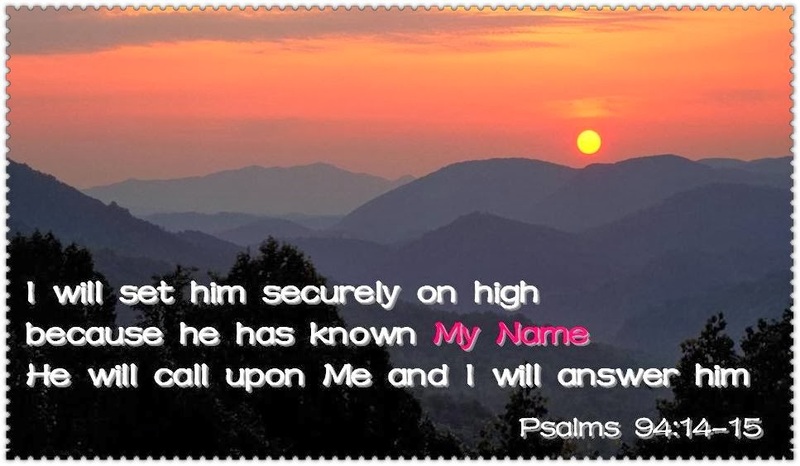 If we truly know His Name and call upon Him, He will answer us. The OT saints often call upon God's Name in prayer because they have a good understanding of the "Name" of God. You need to understand the spiritual riches in the "Name" in the Hebrew Bible. People in OT have a different kind of understanding of "Name" than we do in our modern culture. The Hebrew word for “name” is שֵם (SHEM). SHEM has a much deeper meaning than just a name that we vocalize. In ancient Hebrew culture, personal names mean much more than just a means of identification. They carry deep significant meaning to the person. In our modern society, your name is your identity. When people think of your name, and by associating your name from their interaction with you as a person, they have a mental picture of what you look like and what type of a person you are. However, a name in itself doesn't really reveal deeper meaning of who you are. For example, my full name is Rosablanca. It's a Spanish name given to me at birth, and it means 'white rose'. It's a pretty name. It doesn't mean that I am a white rose. It doesn't mean that I smell like a white rose either. It's a name that identifies who I am. “White” reminds me of “purity”, a path I pursue because of having this name. However, in Hebrew culture, names carry significant meaning. Names in Biblical times were very important as they reveal a person's character. A person's name signifies a person's character, reputation, honor and glory. “Yahweh's SHEM” carries excellence, glory, authority, majesty, holiness, goodness, and strength. When we come to know God's Name and call on His Name, we experience His excellence, glory, authority, majesty, holiness, goodness and strength.